Hey Everyone, How is your Ramadan month going on? I hope you are having a blessed month. 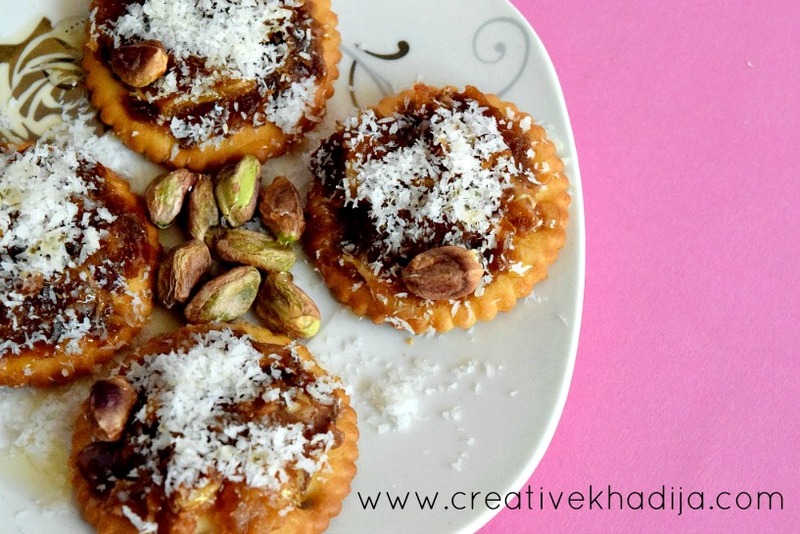 As promised, Today again I came up with more Ramadan recipes. I am glad to see you liked my previous recipe blog post. 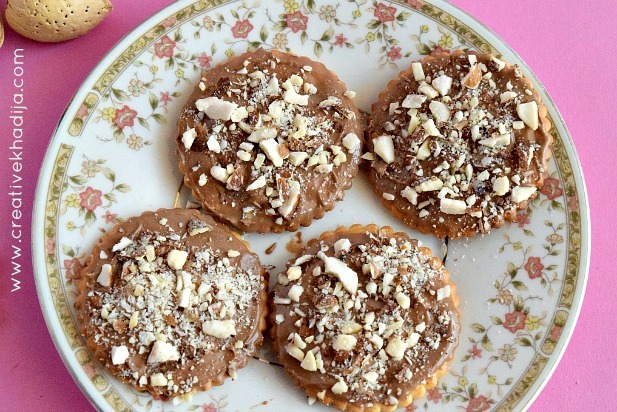 Let’s have a look at my new 5 Quick Energy Snacks Recipes with Cracker Biscuits. Do you like cracker biscuits? Which flavor is your favorite by the way? I don’t like most of the biscuits but crackers are my all time favorite. 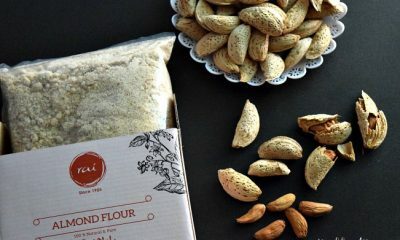 Luckily I was contacted by my favorite cracker biscuits brand for sharing some of my recipe ideas along with their product & food photography. It’s iftar themed recipes project. 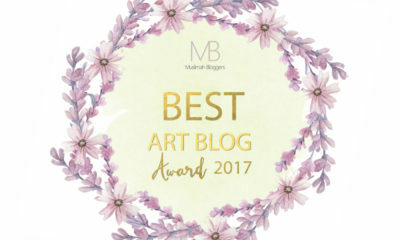 I truly enjoyed working on it throughout. 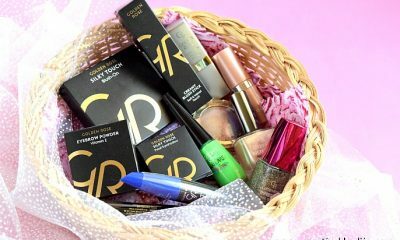 I can not reveal all details right now as its not yet launched by the brand yet. I will be sharing soon hopefully. Just have a look at what unique bite sized recipes I have done for my client. 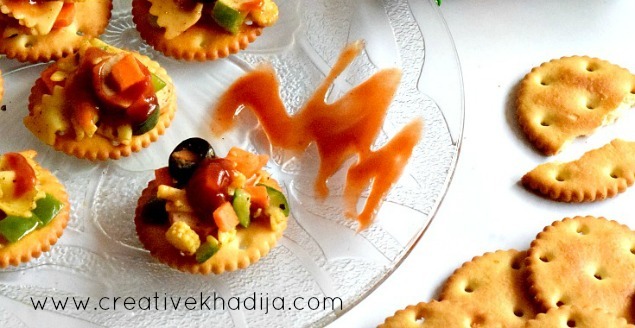 In my today’s blog post I am going to share 5 easy & quick bite sized energy snacks recipes. 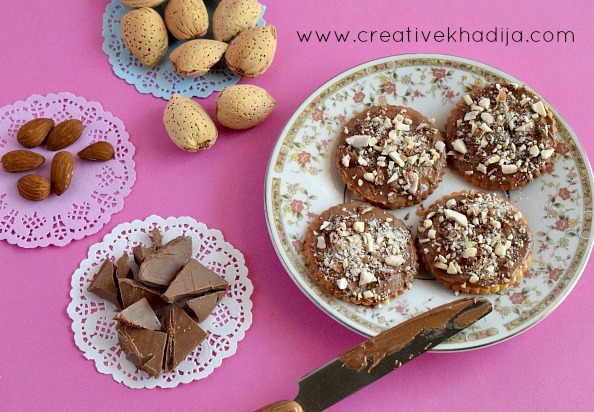 I hope you will enjoy these Ramadan recipes by Creative Khadija. 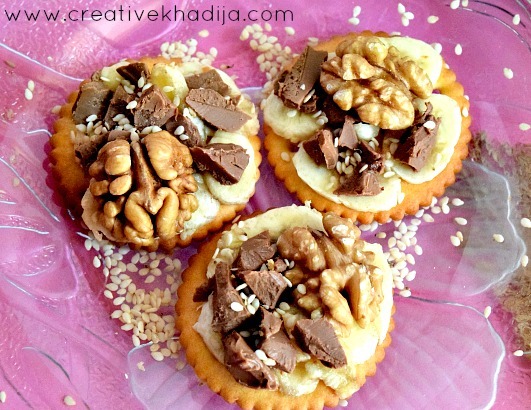 Cut bananas into slices & put thin slices on the top of crackers. Brush some honey on it & spread chocolate chunks & nuts too. I can try crushed nuts too but I prefer a whole piece of walnut here, It’s up to you whatever you liked most. Sprinkle some sesame seeds & repeat the process for other crackers too. Iftaar platter is ready now. I know it’s summers season & nuts doesn’t sound a cool idea but these are energy snacks & we all need energy after a whole day of fasting. So it’s okay! Right? First, Make sugar caramel. You will need one cup water & half cup sugar. Boil the water in a sauce pan & mix sugar well. Let water dry & make thick sauce of sugar. 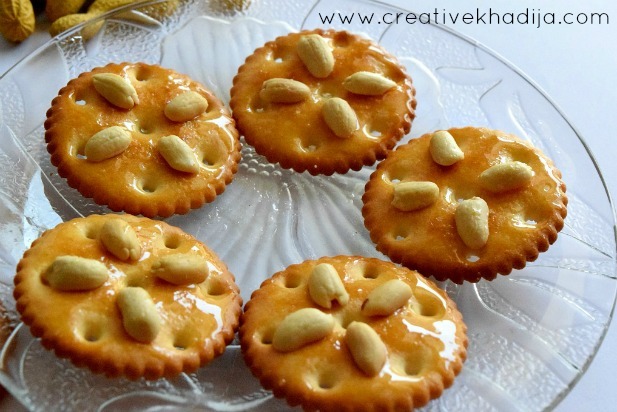 Apply this caramel on biscuits before it gets cold & put peanuts on biscuits as well. You can also dust some sugar powder but also remember it will be too sweet then. Melt some chocolate chunks. Do not melt in a pan on direct flame. Boil some water & put a glass bowl in it. Add chocolate in the glass bowl & let it melt with the heat of boiling water. Within two minutes there is a chocolate paste. 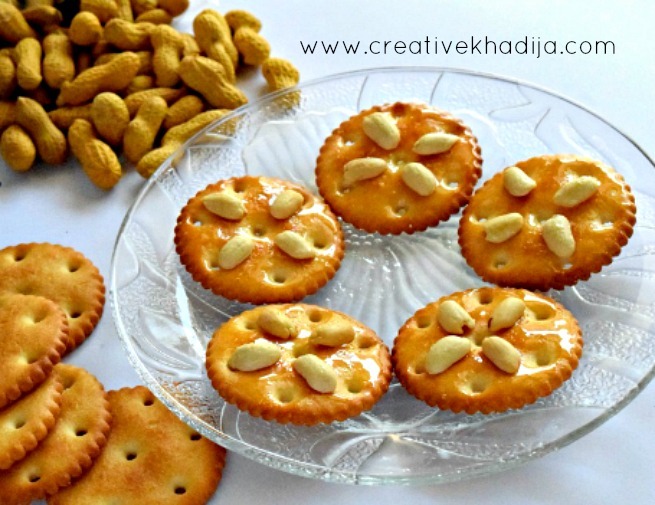 Spread the paste on cracker & sprinkle crushed almonds on biscuits. Let it get cold & fix well. Ready to eat! You can also save these in an air tight jar on a cold place! Let’s eat macaronis in a different way! No need to have spoon or forks! 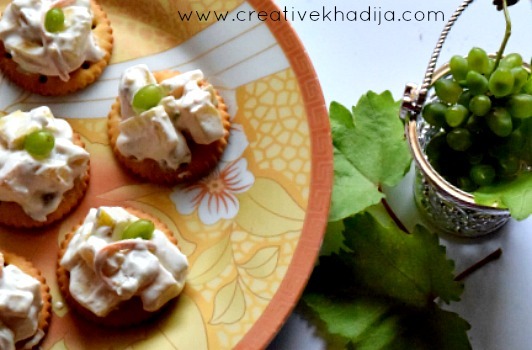 Put your macaronis on crackers & set it in iftar platter. If you feel like they will drop down & will be slipping from biscuits, Make sure to spread some ketchup base on cracker first. Is there anyone who is looking for macaroni recipe? It’s simple vegetable macaroni. 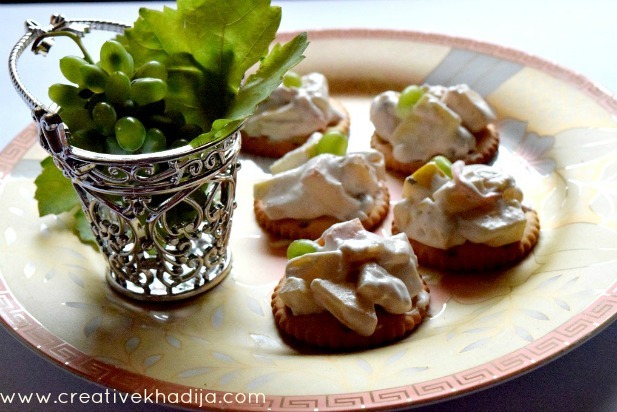 For cream salad, Try cutting small sized fruit chunks otherwise they will drop down from the crackers. These grapes are actually home grown & they were not yet ready to reap when I was working on this photography project. As I need these for my photography so just get these in. Aren’t they looking good? Feel free to ask me if there is any confusion in any recipe. I am here to explain! I hope you enjoyed these recipes. 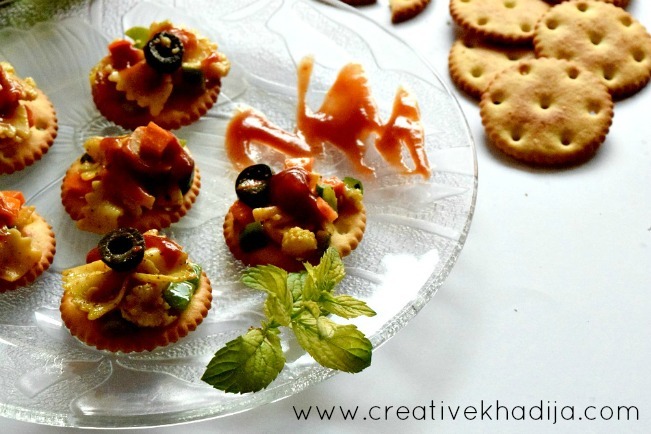 My family always enjoys whatever I cook & try new recipes, They liked my this food experiment with cracker biscuits as well. 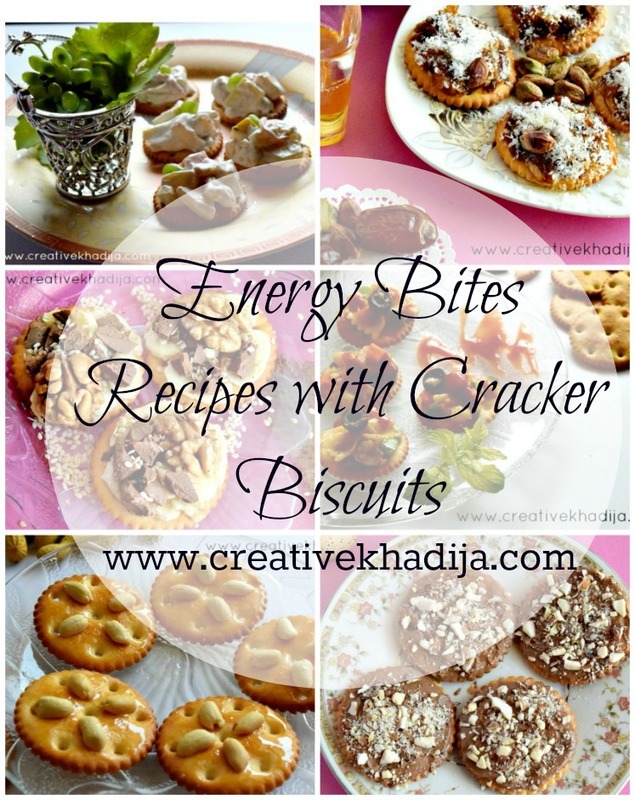 I hope you also liked my 5 Quick Energy Snacks Recipes with Cracker Biscuits. Feel free to share the recipe with your friends. Use the social media networks buttons on blog sidebar or below the article. You can check more recipes here. 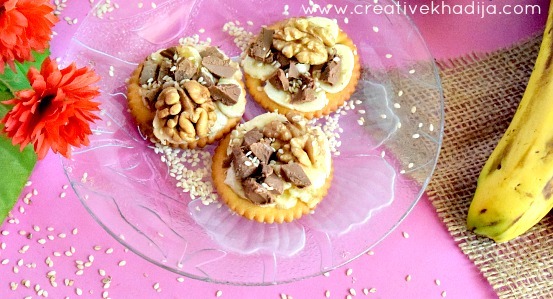 Don’t forget to let me know if you try any of these recipe with cracker biscuits. Have a blessed day! 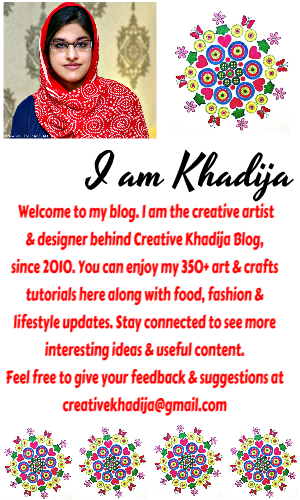 Good job Khadija! The photography is right on point and these recipes seem so quick and easy! Going to try Vegetable Macaroni snack! They look really good, I will definitely try the vegetable macaroni. I also love crackers biscuits. All recipes are very easy and look yummy. What a great selection a cracker snacks. I don’t think I’ve ever seen such a variety before. 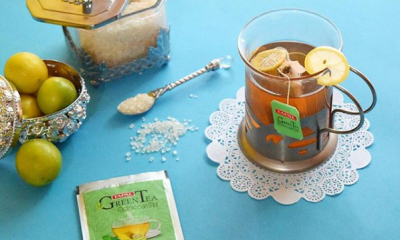 Thank you for sharing I will have to try some this summer. These all sound so good! Especially the banana, nut, chocolate ones! Great recipes, yummy, thanks for sharing and stopping by. wow, this is so creative and better than my boring pbj or cheese on crackers. pinning this!!! thanks for sharing.